Carrig Montessori's Mindful Parenting program is a 5-6 week course for parents and their babies/toddlers ages 6 months-2 years old. Registration includes both our Mindful Parenting classes and Parent Support and Discussion groups. Our Montessori classroom offers your child the chance to explore independently and purposefully as they interact with carefully selected materials. Parents are supported in stepping back from their child so that they can observe their abilities, interests, and approach to the classroom. Each parent is provided a journal in which they are encouraged to take notes on a specific focus each week. Trained Montessori guides set the tone in this 90 minute class, as we move through a work cycle, group snack and end with stories and songs. 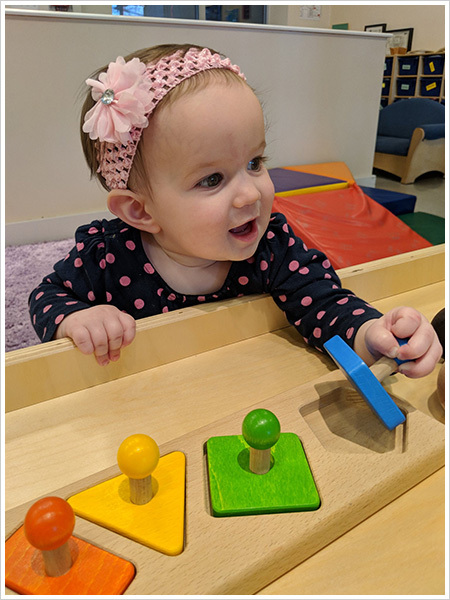 During the Parent Discussion Nights, Montessori guides are pairing their knowledge of child development and the Montessori Method with parents observations and questions to lead discussions that are a benefit to all. Specific discussion topics may include changing your home environment to support independence, age appropriate expectations, potty training, sleep, eating, sharing and discipline. Babies and toddlers are growing and changing at a pace that can feel exhilarating, but also overwhelming for both them and us! Keeping up with your child's rapidly changing development is not only vital to supporting their growth, but informs your ever-changing job description as a parent. Mindful Parenting gives you the tools to observe where your child is today so that you can support the child they are becoming tomorrow. To attend Mindful Parenting Class, children must be between the ages of 6 months and 2 years at the start of class. Registration includes both our Mindful Parenting classes and Parent Support and Discussion groups. We do not offer refunds for any missed days. March 2nd, March 9th, March 16th, March 30th and April 6th (we do not have class on Saturday, March 23). Monday, March 11, Monday, March 25 and Wednesday, April 10. The Spring session of Mindful Parenting is now full. Please check back this summer for information on our Fall session!.